Dr. Gervais utilizes a variety of chiropractic methods at Chanhassen Chiropractic. His goal is to provide his patients with the techniques and modalities needed to resolve their injury and maintain an active, pain free lifestyle. Chiropractic adjustments are offered using a hands on approach, but in some instances, instrument assisted adjustments may be utilized as well. Chiropractic adjustments help to improve mobility in the joints of the spine and extremities. When there is a lack of motion within a joint, it can potentially lead to a wide variety of issues ranging from painful movement patterns, dysfunctional movement patterns, nerve related pain syndromes and much more. ART® is a patented, state-of-the-art soft tissue system/movement-based technique that treats problems with muscles, tendons, ligaments, fascia, and nerves. Headaches, lower back pain, TMJ dysfunction, carpal tunnel syndrome, shin splints, shoulder pain, sciatica, plantar fasciitis, knee problems, and tennis elbow are just a few of the many conditions that can be resolved quickly and permanently with ART®. These conditions all have one important thing in common: they are often overuse injuries. Every ART® session is actually a combination of examination and treatment. The ART® provider uses his or her hands to evaluate the texture, tightness and movement of muscles, fascia, tendons, ligaments and nerves. Abnormal tissues are treated by combining precisely directed tension with very specific patient movements. Acupuncture is one of the oldest, most commonly used forms of medicine in the world. Originating in China more than 4,000 years ago, acupuncture is currently one of the most widely researched, practiced, and respected forms of complementary medicine in the United States. Myofascial trigger point dry needling (MFTrPDN) is a treatment to restore proper function to abnormally behaving muscles. Adhesions and tight bands that develop in muscles create localized pain or refer pain signals to other areas. The affected muscles become locked and cannot function normally, which restricts movement and causes pain. Adhesions develop from overuse, trauma, poor posture, lack of exercise, sleep disturbances, vitamin deficiencies, joint arthritis or nerves compressed at the spine or entrapped at other locations. Dry needling utilizes sterile, thin monofilament needles, and relief is often rapid with a reduction in pain and improved function. Dermal Traction Method (DTM) is a different type of manual approach in that it prioritizes the health of the neurology in painful movement patterns. Pain of nerve origin is called neuropathic pain but that term has historically been reserved for larger neurological structures such as nerve roots and peripheral nerves. Most physical medicine and rehabilitation targets so-called mesodermal structures (bone, joint, muscle, tendon, ligament) and considers painful movement to be reflective of inflammatorily mediated nociception. Historically, the health of the local neurology itself has not been a focus of practice. In the way that McKenzie allowed a reconception of spinal nerve root interface, and Alf Brieg, David Butler and Michael Shacklock advanced our understanding of peripheral nerve neurodynamics, DTM considers the neurodynamics of the superficial and cutaneous nerves. What is FDM? FDM stands for the Fascial Distortion Model developed by Dr. Stephen Typaldos, DO. It’s called a ‘model’ because it isn’t a technique. It’s actually a treatment model in which virtually all soft tissue injuries, or musculoskeletal complaints, are viewed through 1 or more of the 6 different types of alterations to the body’s connective tissues. FDM has no protocols to memorize. Yet, FDM contains a detailed physical assessment, which leads to a specific diagnosis, and provides objective outcomes. The patient’s verbal and physical descriptions, coupled with the mechanism of injury and relevant orthopedic tests, will lead the practitioner to the proper form of soft tissue treatment. Shockwave Therapy utilizes pressure waves that stimulate metabolism, enhance blood circulation and accelerate the healing process. This non invasive, highly effective treatment provides relief of tendon insertional pain related to areas in the neck, shoulder, back, upper extremity, lower extremity, foot, ankle and myofascial trigger points. The treatment virtually has zero risk or side effects. Please keep in mind, in some instances, patients may experience minor discomfort which can last for a few days. It is normal to have some residual pain after exercise or a full day of work following shockwave treatment. 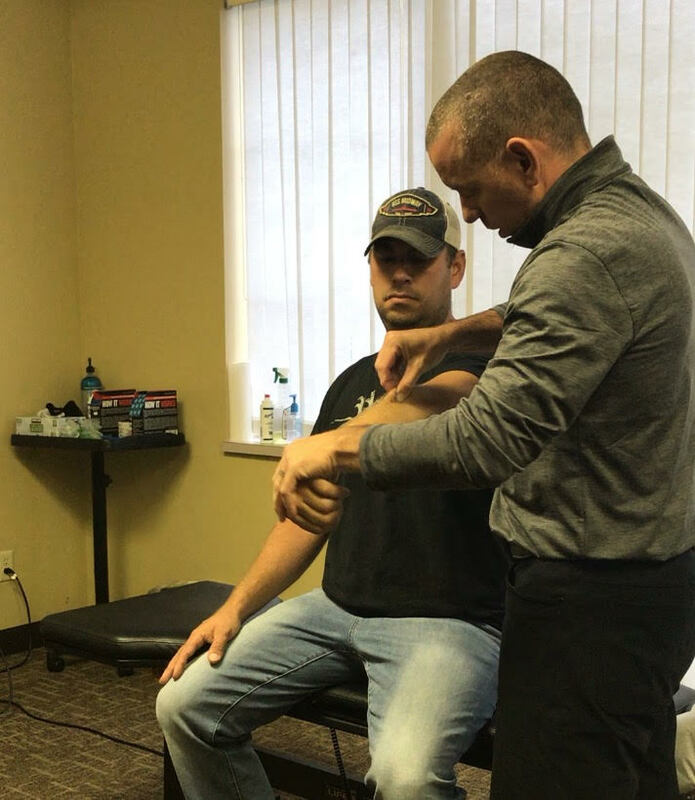 Once you have been evaluated and treated, you will receive a prescription of exercises to perform in our office as well as outside our office to help you recover from your injury. Whether your condition requires mobility exercises to improve range of motion, or spinal stabilization exercises, Dr. Gervais believes in a proactive approach with his patients. Starting exercise rehabilitation as quickly as possible provides the best outcome for a full recovery as well as minimizing the risk of a recurring injury. TheraStim is a direct current electrotherapy modality that is utilized for reducing pain, muscle spasms, optimizing range of motion and increasing circulation to the affected areas of injury. TheraStim is a neuromuscular stimulator that delivers electrical signals to the body through conductive electrode pads to provide relief for a variety of injuries. It’s unique waveform and use of direct current allows it to get deeper into injured tissues than traditional electrical muscle stimulators or Tens Units without surface pain or damage to the skin or soft tissues. Therastim is highly effective in resolving neck spasms, lumbar radiculopathy/sciatica, rotator cuff injuries, frozen shoulder, carpal tunnel syndrome, lateral and medial epicondylitis/epicondylosis, plantar fascitis, wrist pain, ankle pain, hamstring/ calf strain, knee injuries, bursitis and many others ailments. RockTape helps bring dormant muscle back to life and help calm down the overactive muscles. It helps your body coordinate movement as if it weren’t hurt, hence allowing it to heal properly. When RockTape is applied to the skin, it has a microscopic lifting effect underneath the skin and between the many layers. This allows the by-products created by inflammation to be removed more quickly. Research has shown that RockTape on skin can attenuate muscle fatigue. In rehab, this is very important, not only for the parts of your body that are currently hurting, but also for the surrounding areas as they help to pick up the slack for muscles that are currently not working well.